The Border Collie was named after the borderlands of Scotland where they were used to heard sheep during the late 19th century. Many Border Collies today can be traced back to "Old Hemp", a tricolor dog that showed the same work style that is seen in border collies today. While the breed is still widely used on farms across the world, they also excel in all dog sports including agility, obedience, fly-ball, and frisbee. The Border Collie is ranked among the top breeds of dogs in intelligence and are known for their drive to never stop working. 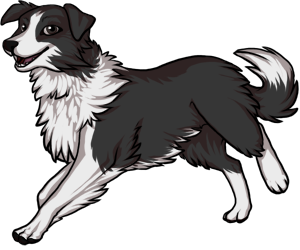 In 2010, a Border Collie was reported to have learned 1022 words. The Border Collie was originally known as the "Scotch Sheep Dog". Border Collies are said to have ancestry in the Vikings that used them to heard reindeer.